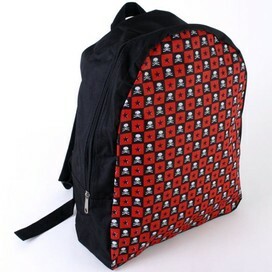 A black backpack with a checked skull and stars design print. Red, white and black design. Fully adjustable padded shoulder straps. All round zip closure. Size is approx 38cm tall x 31cm wide. This item is sold by UK Home & Garden a store located in the UK and duty/gst may apply. Please check www.whatsmyduty.org.nz for more. Item includes free worldwide shipping. Please note the item is coming from the UK. Delivery should take between 6-10 working days.